I didn’t leave because of you. I don’t love you any less. I won’t stop thinking about you or missing you or hoping you are well. You know how much I love you. I won’t stop wondering about how you are doing or forget your sweet faces or devious antics. I can’t imagine life without you. But it was time. Those of you who know me, you know how much I love a challenge. You know I crave chaos and creativity, newness and imagination. And it wasn’t that you won’t challenge me anymore. It’s that the challenge had become too predictable, too ordinary, too comfortable. The worst thing I can imagine is losing that excitement, that desire to push you and myself as hard as possible every day. If my love of teaching faded, it would destroy me. If it faded while I was in a classroom, it wouldn’t be good for you either. I could feel that tattered edge of burnout eating at the corners of my joy. Not because my positive feelings about spending my days with you changed, but because I was getting restless. Restlessness chafes. It feels dangerously close to dissatisfaction. How do I explain abandoning contentment? I don’t know. All I can say is my own dumb brain is totally to blame. I took this step confident that I am leaving you in good hands. I trust and admire every member of the teaching family I am leaving behind. You are safe. 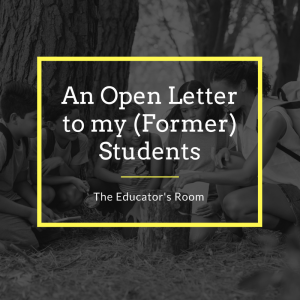 The combination of wanting to work with teachers and trusting you are still surrounded by amazing professionals led me to a point where I had to go. I had to go out and find a new adventure. Those of you who know me, you know I didn’t leave education. I couldn’t and still breathe. Instead, I left the classroom. Those of you who know me, know how much I love working with, collaborating with, and helping other teachers. Nowadays, that’s my job. I spend my time finding and organizing the best materials, lessons, and ideas and getting those things into teacher’s hands. The capacity to impact so many more children is both exhilarating and intimidating. It is fun and challenging and exactly what I needed. And I miss you more than you could know. I will grieve for the classroom I am not setting up, the classes I’m not planning, the new names I’m not learning. Thank you. I hope you don’t forget me. I will absolutely never forget you. And I can never thank you enough for letting me touch your lives. Hey Ms. Hirsch! I’ve been trying to get in touch with you for about 7 or 8 years now. I’m a former student of yours, my name is Ashley Hughes. I wanted to talk to you about something important. I hope this is a good way to reach out to you.